Every year, thousands of imperiled loggerhead, green and leatherback sea turtles come ashore to nest on Florida’s Atlantic and Gulf coasts. Yet because of dwindling nesting habitat and a host of other threats, the long-term recovery of sea turtle populations is at risk. A green turtle laying eggs. Florida’s nesting turtles dig tens of thousands of nests each summer. Each nest contains about 100 eggs, but it is estimated that only one in 1,000 hatchlings survive to maturity. In large part, this is due to too much artificial beachfront lighting. 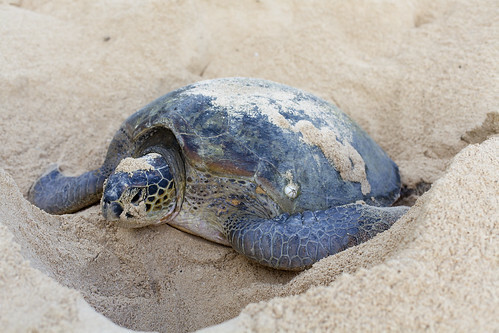 Because newly hatched sea turtles use natural light and reflections to help them locate the water, excessive light on beaches can cause hatchlings to become disoriented. When this happens, hatchlings head inland or wander along the beach instead of out to sea. Lights can also discourage females from coming ashore to nest. 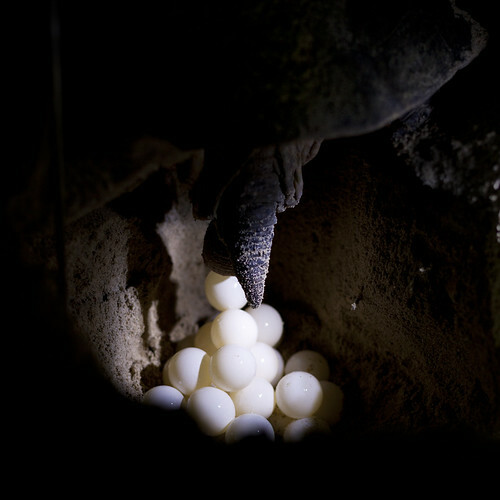 The female turtle digs a nest cavity with her rear flippers, and lays between 60 and 160 ping-pong ball sized eggs per nest. After covering the eggs with sand, she returns to the sea. And after about 60 days incubation, the hatchlings dig their way out of the nest at night to avoid predators. With support from Florida Sea Grant, students and faculty in the Conservation Clinic at the University of Florida Levin College of Law reviewed current artificial lighting laws and found them inadequate. The clinic worked with lighting experts at the Sea Turtle Conservancy to develop a set of best lighting practices and tested local ordinances against the best practices. 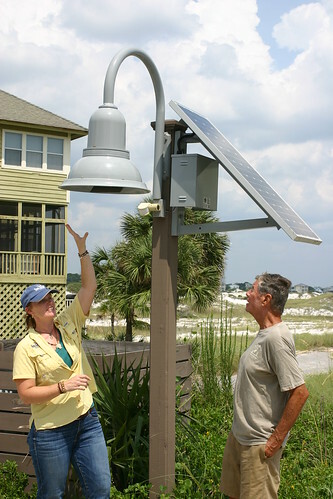 Walton County Sea Grant extension agent Brooke Saari, left, talks to a Gulf Trace homeowner about the new turtle turtle friendly street lights. While Ankersen and Conservation Clinic students were developing the model ordinance, Florida Sea Grant extension agent Brooke Saari, has been helping one beachfront community comply with the existing Walton County sea turtle lighting ordinance. The Gulf Trace community on south Walton County’s Grayton Beach is a neighborhood of 86 homes that is nestled between two state parks on one mile of beach. Saari, who already had a grant from the U.S. Fish and Wildlife Service to purchase turtle friendly lights, helped the community receive an additional grant from the Sea Turtle Conservancy. With these grants, Gulf Trace was able to install 249 fixtures and 163 bulbs on 36 homes, and the community received six solar turtle friendly street lights. In addition, language was added to the homeowner’s association rules promoting proper turtle friendly beach practices for residents and visitors. Gulf Trace homeowner Nancy Lewis, who spearheaded the project, said the community has seen immediate results. If you want to learn more about the Conservation Clinic’s model ordinance, the full report is available on the clinic website. 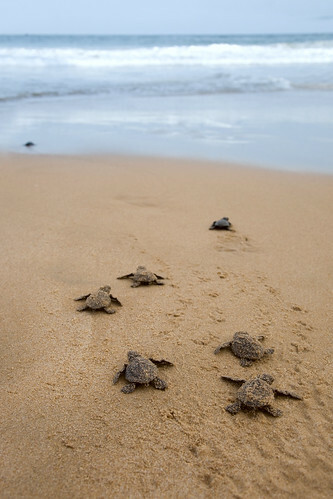 Loggerhead sea turtle hatchlings make their way to the ocean.